Bruno Mars: You can call it my first single, but I call it the invitation to the party. 2.11.2016 -24k Magic: 122.448 (+1.055)// 3.12.2016 - 24K Magic: 154.849	(+2.723) / Kworb. Bruno Mars: Jump in the Cadillac. Girl, let's put some miles on it. 29.01.2017 - That's What I Like 17.460 (+2.156)//____________________________________________________ //___29.03.2017 - That's What I Like ???????? ????? But you're always welcomed to help. This Friday, Bruno Mars returns. The Atlantic Records artist announced that a new single, entitled "24K Magic" (pronounced "twenty-four karat magic") will drop Oct. 7. "Excited to announce 24K Magic, out this Friday!!" he said on Instagram. "You can call it my first single, but I call it the invitation to the party." 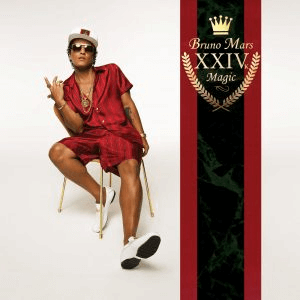 "24K Magic" will be the first song released off his forthcoming third studio album, his first since 2012's Unorthodox Jukebox, which yielded the hits "Locked Out of Heaven," "When I Was Your Man" and "Treasure." 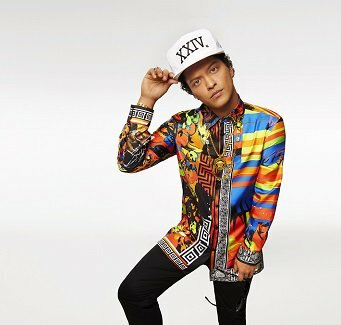 Since that release, Mars has sung on Mark Ronson's 2014 hit "Uptown Funk," written "All I Ask" with Adele, performed at two Super Bowls and debuted the ballad "Rest of My Life" on the season-two finale of The CW's Jane the Virgin. Skrillex has mentioned that he's an upcoming collaborator on new material. No album release date or title has been announced. Still, of the album, Mars reassured his fans on Twitter, "You think I've been playin this whole time? You don't think I'm masterminding the return?" So excited, friday won't come soon enough! Does anyone know any producers or songwriters for the song? Album also titled '24K Magic', contains 9 tracks and releasing on November 18th. The song tries to be Uptown Funk 2.0. Kind of slow out of the gate I expected top 20 by now :-? Is it featured on US or UK iTunes home page? He is the face of Spotify's new music friday and has a huge banner on the browse page. Good job Atlantic! Good job to Bruno himself. He was the singer at Spotify CEO wedding. The music video is out. Climbing a bit slowly compared to what i was expecting. Have yet to hear the track. Bookmarking this. Just listened to it. Not really feeling it. He could've done much much better after his long break. Uptown Funk 2.0. This is going to smash. Can't wait to see Spotify numbers tomorrow! Climbing a bit slowly compared to what i was expecting. It's climbing way faster than Uptown Funk & Looh.